U.S. Rep. Bruce Poliquin, R-Maine, fields questions from reporters at the Portland International Jetport in this Nov. 27 photo. 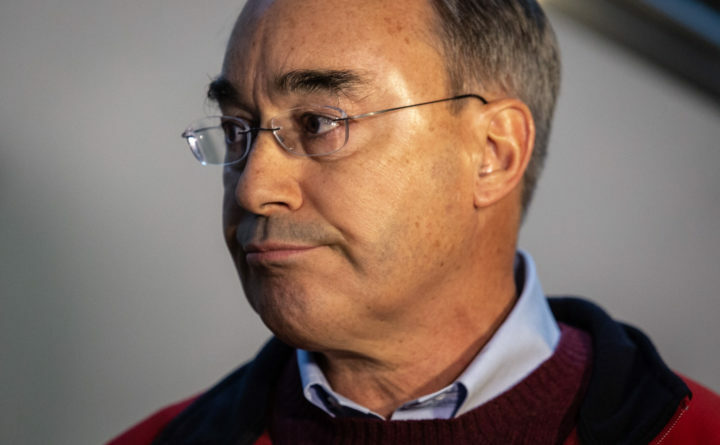 AUGUSTA, Maine — Outgoing U.S. Rep. Bruce Poliquin of Maine’s 2nd District announced on Monday that he will end his federal challenge to the state’s ranked-choice voting system, which delivered Rep.-elect Jared Golden’s historic 2018 victory over the two-term incumbent. The move from Poliquin, a Republican, ends a lawsuit that threatened to drag out for months in federal court, where there had been little sign that he would ever convince judges to agree with his arguments that the voting system enshrined by Maine voters in 2016 is unconstitutional. In a statement, Poliquin said while he stood by his arguments, he believed it was “in the best interest of my constituents and all Maine citizens to close this confusing and unfair chapter of voting history by ending any further legal proceedings” against ranked-choice voting. Golden, a Democrat, beat an incumbent for the first time in the modern-era history of the 2nd District, which encompasses Maine’s northern population half, after he overcame Poliquin’s first-round lead by gaining later-round votes from supporters of two left-leaning independents. Poliquin sued Maine Secretary of State Matt Dunlap two days before the final count was released showing that Golden won by more than 1 percentage point. The same day, U.S. District Court Judge Lance Walker ruled against Poliquin in a bid to delay the ranked-choice count. Nothing improved for Poliquin’s case. In December, Walker issued a more comprehensive ruling against the Republican’s challenge to the method. The outgoing congressman then appealed to a higher court to stop Golden from being sworn in to succeed him, but the 1st Circuit Court of Appeals rejected that challenge last week. Golden will be sworn in Jan. 3 after winning the first general election in Maine history to be decided by ranked-choice voting. His incoming chief of staff, Aisha Woodward, said he is planning a listening tour of the district that will begin in late January.